I posted a pic of one of these little birds on Dec. 26. It was cloudy that day. Today, it was cold. but we had beautiful sunshine. 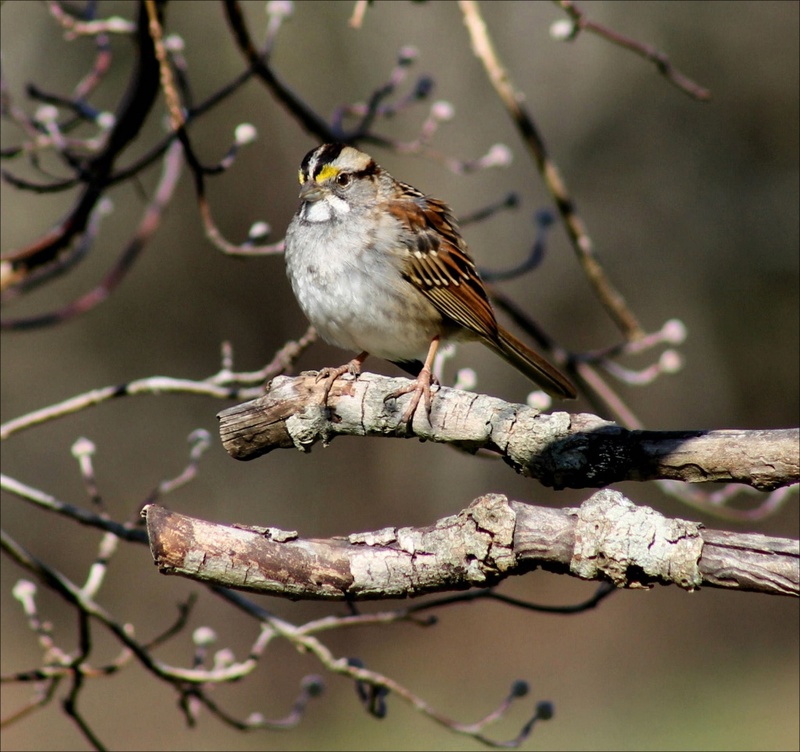 Sunshine brought the colors out better in this White-throated Sparrow. The sock monkey hat may be making an appearance this weekend. I did get a remote for my camera, from my wonderful hubby, for Christmas. I'm still weighing the pros and cons! LOL! lovely shot and I love the colors. You're so fortunate to have such lovely birds to shoot. I'm in Texas and we have nothing here right now but gray doves. Beautiful shot! It is amazing what light, esp. sunlight does! I teach Latin roots and school and always knew that "photo" refers to "light" and "graph" meant "writing" or "drawing" and all that... Not until I started learning back in June did I realize how it was ALL about the light...capturing light, managing light .....I love this! @lolanae Brandie....What is the sock monkey pic? @soozieqt Thank you Susan! I have a selfie in my project, but it's well hidden! LOL! Your bird photos are so good. Beautiful shot. Great color tones and details and textures. A fav. Gorgeous shot, such a pretty little birds and fantastic focus!! when you gonna fry 'em up?? Wow! I love the detail! amazing! it sure makes all the difference! Gorgeous Carolyn - love the detail in the little bird and the perfect bokeh. Clearly your talents are not restricted to photographing cats. Spectacular detail on this little bird. Nicely captured. What a wonderful variety of sparrows! And such a great capture! This is gorgeous. I love how sharp this is and how nicely composed it is, as if you set him up. I wish I could become more technical - I love the background - is that DOF? It is a perfect photo...I love your bird pictures! I must FAV because I love the total composition!!!! Oh and YES...sock monkey shot!!! Bring on the sock monkey hat--whoot! My daughter got a wolf ears fuzzy hat that I've been stalking her to photograph. She's too fast for me though. Sweet shot - sunshine makes a world of difference! My interest is piqued about that hat - can't wait to see it! He looks like a determined little fellow! Beautiful focus and DOF. Great shot! @lolanae LOL! I agree - DO THE SOCK MONKEY PIC! This is some glorious light you've captured on this guy! Glad you caught this little guy again. This picture is so clear. Lovely details. Now I just have to say......Sock Monkey, Sock Monkey! Sock monkey! Sock monkey! Sock monkey! I love the black stripes on the sparrow's head! Gorgeous sunshiney pic! Gorgeous light on this cutie! And YES for the sock monkey hat appearance! Wonderful detail, great lighting. Such a dapper little dude. Sock Monkey!!!!!! Such a cutie! Your bird shots are all so crisp! I agree with you, it's all about the light! Pretty little bird and love the color of the branches around him! Nice capture of this cute bird. I like his little spots of yellow.